William Barr’s opening statement and early answers at his Senate confirmation hearing Tuesday were carefully designed to emphasize one central fact: He’s not a hack or a politico, like so many other of President Donald Trump’s senior appointments: He’s a former U.S. attorney general under President George H.W. Bush. For that reason, Barr said, he will be independent, should he be returned to the job. He’s at the end of his career, and seeks no “political future.” He is prepared, Barr insists, to “spend all his political capital” if and when necessary. This might sound like spin, but it’s not only spin. True, Barr probably was nominated as Trump’s attorney general because of his memo to the Department of Justice arguing that some parts of the obstruction of justice statute should not be applied to the president. But Barr’s strongest self-interest really is in being an independent attorney general at what promises to be a highly tumultuous moment in U.S. history. His apparent incentive in taking the job is to steady the ship of state. And he seems to believe he can do it. True independence would make Barr a wild card: He couldn’t be counted on to support Trump no matter what. When he knows the facts about special counsel Robert Mueller’s investigation into Russian meddling in the 2016 campaign, he will do what he thinks is right. That could include defending Trump via recommendations for use of the pardon power — if Barr thinks it’s necessary to save the country. It could also include facing down the president and refusing to participate in efforts to minimize Trump’s wrongdoing — if Barr thinks it has been clearly proved by Mueller. That is going to matter when Barr takes on extraordinarily important responsibilities surrounding Mueller’s report, the inevitable White House response, and the political-legal melee that will probably follow. Barr is to be believed when he says that he will follow the law, because he has nothing to gain by doing otherwise. To be sure, Barr has already made it clear that he will interpret the law in the light of a commitment to a strong version of executive power, which will no doubt benefit Trump. Yet Barr’s commitment to following the law also makes it likely that, if there is credible, solid evidence against Trump in the Mueller report, he isn’t going to paper over it or suppress it. Barr’s personal respect for Mueller isn’t a show. 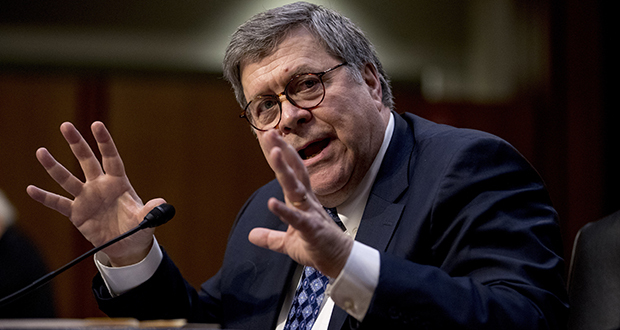 It’s a reflection of the common consensus among experienced government officials who have worked alongside Mueller, as Barr did in the first Bush administration. Barr did not depict Mueller as the enemy. As far as is possible to determine, he genuinely doesn’t consider Mueller to be the enemy. And that distinguishes Barr from the Trump White House, and much of the rest of the Trump administration. No Trump administration official has ever said anything so warm about Mueller. With these comments, Barr wasn’t just reassuring the Senate that he won’t fire Mueller. Barr was signaling that because he is a Bush veteran (like Mueller), he is utterly unlike the loyalists who populate the Trump administration. The normal thing in U.S. government is that many senior appointed officials have experience at senior levels in prior administrations. This avoids rookie errors — and enmeshes officials in a web of institutional loyalties and commitments that transcend the individual who happens to be president at the time. The only other former Bush appointee in a serious role is John Bolton at national security adviser. And Bolton himself got the job partly because he was perceived by Trump as having been a radical figure in George W. Bush’s administration. Barr is an entirely different matter: someone who is proudly and in a highly traditional way presenting himself as a mainstream, experienced, Republican official. That traditional approach has practical implications. It means Barr will take seriously the independence of the Department of Justice on matters of criminal justice investigation and prosecution. It also means that Barr’s loyalties lie not to Trump alone, but to a broader set of institutions that includes the Justice Department, the presidency, the Republican Party, and yes, the republic itself. He doesn’t want to go down in history as someone who whitewashed Trump. He wants to be remembered as distinguished public servant who came out of retirement to help save the country. Expect Barr to defend the president’s legal prerogatives aggressively. His term won’t be free of controversy. But also expect that, if Mueller can show Barr definitively that Trump colluded with Russia to subvert 2016 election, committed crimes or engaged in an unlawful cover-up, Barr will listen — and act accordingly.